On Friday, June 10th, the Vermilion Parish Coastal Protection and Restoration Committee hosted the first Vermilion Parish Coastal Day in Intracoastal City, Louisiana. Joining the Vermilion Parish Coastal Committee was the Vermilion Parish Police Jury and leaders of Louisiana Coastal Protection and Restoration Authority (CPRA). 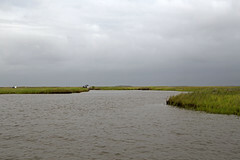 The one-day event was dedicated to educating local landowners, government officials, and the general public on the success of previous coastal restoration projects as well as current coastal issues in hopes of uniting the community to support the progression of coastal efforts within Vermilion Parish. Ronald Darby, President of Vermilion Parish Policy Jury, and Kevin Sagrera, Chairman of Vermilion Parish Coastal Committee, welcomed Johnny Bradberry, Executive Assistant to the Governor for Coastal Affairs and CPRA Chairman. Bradberry gave brief updates on current bills and legislation pertaining to coastal projects. Michael Ellis, Executive Director of CPRA, discussed the valuable natural resources available in Vermilion Parish. Ralph Libersat of the Vermilion Parish Coastal Committee presented an overview of Vermilion Parish coastal projects, explaining the critical need to protect what is there now, as opposed to having to recreate land years into the future. Libersat discussed the $92 million of coastal project expenditures in Vermilion Parish to date:$70 million from CWPPRA, $18 million from Vermilion Parish, and $3.4 million from surplus funding, giving a conservative total net benefit of 5180 acres. Libersat highlighted a few CWPPRA projects such as ME-31, TV-12, TV-18, TV-63, and TV-03; Libersat continued by expressing that Vermilion Bay is losing wetlands at a rate of 8-10 feet per day. Following lunch was a site visit to two restoration project areas along Freshwater Bayou and Vermilion Bay. The first project site was Freshwater Bayou Marsh Creation (ME-31), located west of Freshwater Bayou and north of the Freshwater Bayou Locks; this project is in the Engineering and Design phase to create and/or nourish approximately 401 acres of marsh using dredged material. The second project site was Little Vermilion Bay Sediment Trapping (TV-12), located in the northwestern corner of Little Vermilion Bay at its intersection with the Gulf Intracoastal Waterway (GIWW); this project has been completed and was successful in shoreline protection and sediment trapping with terraces.